Following is the full transcript of MIT professor Hugh Herr’s TED Talk titled: “How We’ll Become Cyborgs & Extend Human Potential.” To learn more about the speaker, read the bio here. I’m an MIT professor, but I do not design buildings or computer systems. Rather, I build body parts, bionic legs that augment human walking and running. In 1982, I was in a mountain-climbing accident, and both of my legs had to be amputated due to tissue damage from frostbite. Here, you can see my legs: 24 sensors, six microprocessors and muscle-tendon-like actuators. I’m basically a bunch of nuts and bolts from the knee down. But with this advanced bionic technology, I can skip, dance and run. Thank you. I’m a bionic man, but I’m not yet a cyborg. When I think about moving my legs, neural signals from my central nervous system pass through my nerves and activate muscles within my residual limbs. Artificial electrodes sense these signals, and small computers in the bionic limb decode my nerve pulses into my intended movement patterns. Stated simply, when I think about moving, that command is communicated to the synthetic part of my body. However, those computers can’t input information into my nervous system. When I touch and move my synthetic limbs, I do not experience normal touch and movement sensations. If I were a cyborg and could feel my legs via small computers inputting information into my nervous system, it would fundamentally change, I believe, my relationship to my synthetic body. Today, I can’t feel my legs, and because of that, my legs are separate tools from my mind and my body. They’re not part of me. I believe that if I were a cyborg and could feel my legs, they would become part of me, part of self. At MIT, we’re thinking about NeuroEmbodied Design. In this design process, the designer designs human flesh and bone, the biological body itself, along with synthetics to enhance the bidirectional communication between the nervous system and the build world. 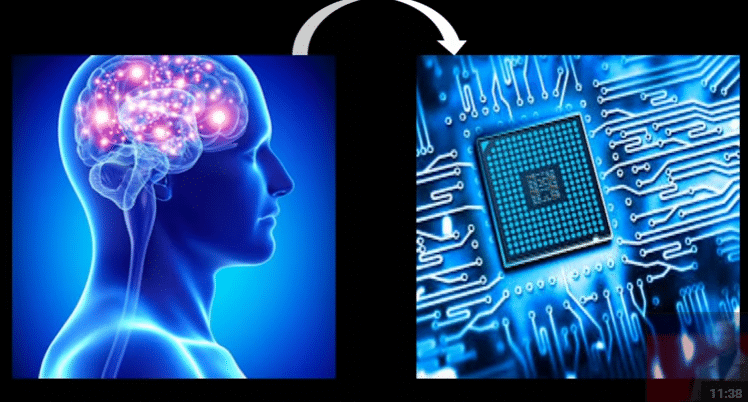 NeuroEmbodied Design is a methodology to create cyborg function. In this design process, designers contemplate a future in which technology no longer compromises separate, lifeless tools from our minds and our bodies, a future in which technology has been carefully integrated within our nature, a world in which what is biological and what is not, what is human and what is not, what is nature and what is not will be forever blurred. That future will provide humanity new bodies. NeuroEmbodied Design will extend our nervous systems into the synthetic world, and the synthetic world into us, fundamentally changing who we are. By designing the biological body to better communicate with the built design world, humanity will end disability in this 21st century and establish the scientific and technological basis for human augmentation, extending human capability beyond innate, physiological levels, cognitively, emotionally and physically. There are many ways in which to build new bodies across scale, from the biomolecular to the scale of tissues and organs. 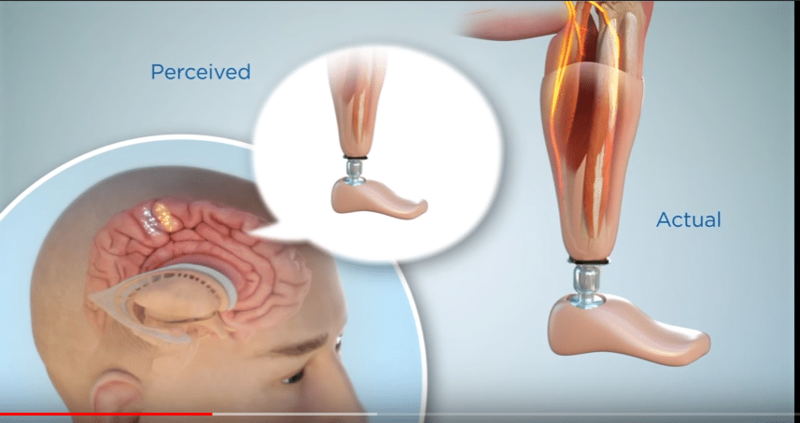 Today, I want to talk about one area of NeuroEmbodied Design, in which the body’s tissues are manipulated and sculpted using surgical and regenerative processes. The current amputation paradigm hasn’t changed fundamentally since the US Civil War and has grown obsolete in light of dramatic advancements in actuators, control systems and neural interfacing technologies. A major deficiency is the lack of dynamic muscle interactions for control and proprioception. What is proprioception? When you flex your ankle, muscles in the front of your leg contract, simultaneously stretching muscles in the back of your leg. The opposite happens when you extend your ankle. Here, muscles in the back of your leg contract, stretching muscles in the front. When these muscles flex and extend, biological sensors within the muscle tendons send information through nerves to the brain. This is how we’re able to feel where our feet are without seeing them with our eyes.